You can find this interview in Letter N°7 sent to the members of the Friends of the Tour du Valat. 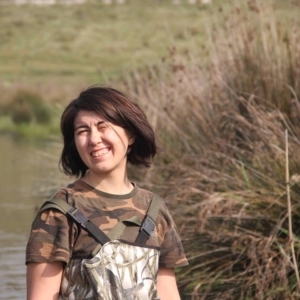 Between 2012 and 2018, Dilara Arslan has studied amphibians and reptiles in Gediz Delta with the support of Tour du Valat Research Center, Doğa Derneği (Turkish NGO for the conservation of biodiversity) and Ege University. Besides her professional research activity, she is interested in bird watching as well as nature photography. When did you first visit Tour du Valat and what was the occasion? My first meeting with Tour du Valat was in Turkey in a meeting with Doğa Derneği in 2012. In that meeting, a Tour du Valat researcher visited Turkey to talk about Gediz Delta problems and to plan a research program for this Delta. At that time, I was in my 2nd year of university and I was 20 years old. During this meeting, everyone was talking about the flora of Gediz Delta. I was the first one to defend the opinion that we should work on Gediz Delta’s herpetofauna. Back then, there was no research in this field and we did not know which species occurred in the Delta. My ideas and suggestions impressed and I started studying the Gediz Delta in collaboration with the Tour du Valat and Doğa Derneği. I was really impressed when I observed Tour du Valat have conducted so many conservation activities on Gediz Delta which is under pressure of urbanization in my country. These studies have been continued for a long time by Tour du Valat, which was a surprise for me. I am really happy to know of this collaboration between the Gediz and Camargue Deltas. What is your best memory at Tour du Valat? I did my first scientific herpetology field work with scientists from the Tour du Valat. That was a great moment in my life. We observed snakes, frogs, lizards. I learned lots of things about scientific methodology. Until that moment, I had never carried out herpetology field work in Turkey. But my biggest dream is to become a herpetologist researcher in Turkey. This field work is a first step to realize my dream. What was your best experience at the Tour du Valat? My best experience was when I caught and observed an European Pond Turtle (Emys orbicularis) in the Camargue Delta which was older than me. What emblematic species of Camargue are your favourites? I think I will choose buffalos and white horses of the Camargue. Why did you join the Friends of Tour du Valat Association? The Tour du Valat is the most important research center in the study of wetland conservation in the Mediterranean. In addition, it works extensively with developing countries to conserve wetlands that are not in France. That’s why I join the Friends of the Tour du Valat. I define myself as a Turkish friend of Tour du Valat. Do you have any advice or messages to pass on to future generations who will come spend some time at Tour du Valat?